ONE St. Petersburg, located at 100 1st Ave N, sold out of all 253 condo units over six months before its recent completion. Following on the heels of ONE St. Petersburg’s success, the Kolter Group is poised to bring another condo development to Downtown St. Pete. Their next project will be located just three blocks south of ONE St. Petersburg at 300 1st Street South. For now, preliminary plans call for a 35-story condominium building containing approximately 200 residences and ground floor retail. Kolter is currently under contract to purchase the land, which is currently being used as a surface parking lot for the Hilton St. Petersburg Bayfront hotel. It’s also one of the largest remaining privately-owned surface parking lots in the downtown core. Kolter could not comment on the cost of the land, however we’ve heard the parcel is under contract for around $17.5 million. The project is still in its due diligence period, however the company is hoping to close on the land later this year. 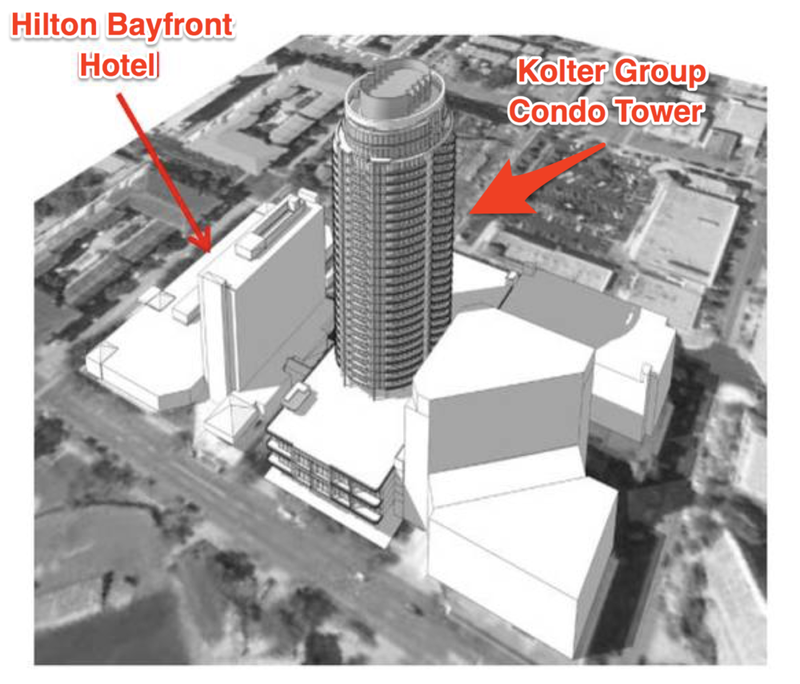 St. Pete Rising uncovered a very early schematic rendering of a condominium concept for the site. This render was not provided by the Kolter Group and may not reflect what is ultimately proposed or constructed on the site. According to the Tampa Bay Times, the developer has asked the FAA to study the potential impacts of a 408-foot building at the site, a standard practice for developers planning projects near airports. Kolter hopes to submit site plans to the city and launch a pre-sale campaign sometime this spring. Construction would likely begin shortly thereafter. With an estimated 30-month construction cycle, the tower is tentatively scheduled to open in 2022. Van Slyke notes that while pricing for the units has not yet been determined, the level of quality and finishes will be similar to that of the units at ONE St. Petersburg. And like ONE, this project will benefit from unobstructed water views, which are expected to attract premium pricing. Additionally, as part of the project, Kolter will be required to replace all of the Hilton's lost parking in the new parking structure - approximately 205 spaces in all. This project joins a recently announced 50-story mixed-used tower proposed for 400 Central Avenue. That development, which is being proposed by the Red Apple Group, will feature 325 condominium units along with 200 hotel rooms and ground floor retail. 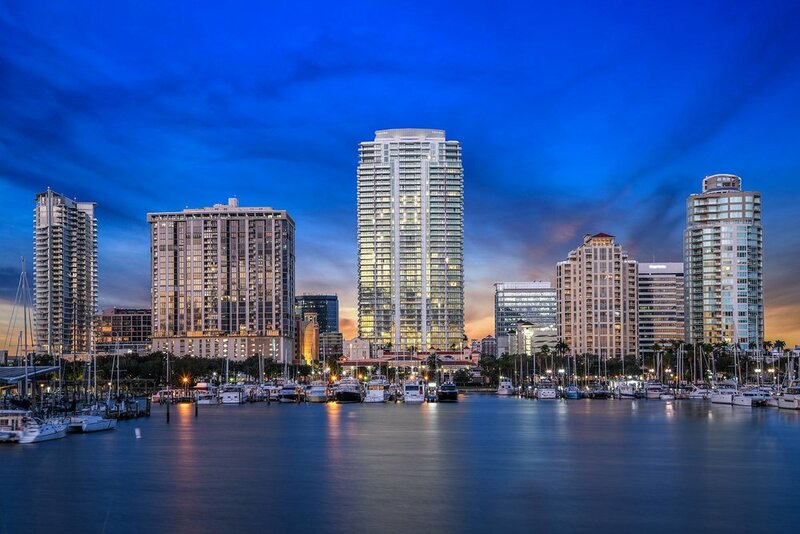 That project is expected to break ground later this year and, once complete, will replace ONE St. Petersburg as the tallest building in Downtown St. Pete. The announcement of these condominium projects reflect the continued confidence developers, both local and national, have in the Downtown St. Pete market, which has seen high demand and increasing prices for residential units ever since the recession. And with over eleven months left in 2019, it’s likely these won’t be the only condominium projects announced this year for Downtown St. Pete.